The postoral fibers are also heavily labeled by anti-b-tubulin. The cell was lightly fixed, placed in metylcellulose and frozen in liquid nitrogen. 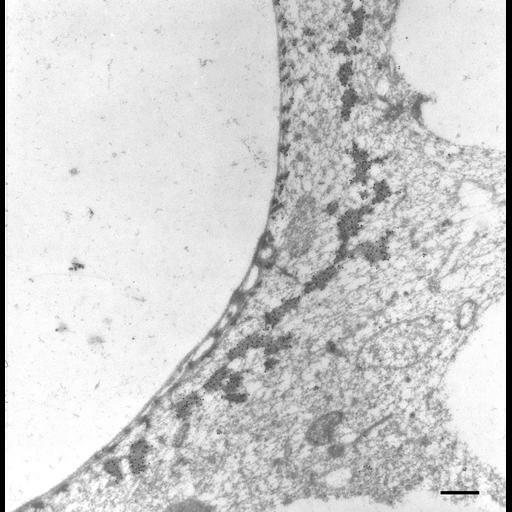 Sections were produced at -100°C before thawing and treated with the b-tubulin antibody followed by immunogold labeled antibody to IgG. TEM taken on 2/25/94 by R. Allen with Zeiss 10A operating at 80kV. Neg. 9,780X. Bar = 0.5µm.